Capitol (Lat. Capitolinus) and Capitolinc Hill (Mons Capitolinus), the temple of Jupiter Op-timus Maximus in ancient Rome, and the hill on which it stood, and which from it received its name. The latter is an irregular oblong with two more elevated summits, on the southern of which the temple was erected. The hill was wholly consecrated to Jupiter, except a nook which was reserved for the god Terminus, who refused to leave the spot when the other gods left out of deference to Jupiter. At the steeper northern summit was the citadel (Arx), built in the earliest period of Roman history. The first foundations of the Capitol were laid by Tarquinius Priscus, but the edifice was not finished till shortly after the expulsion of the kings. It was destroyed by fire in 83 B. C.; was rebuilt by Sulla, and dedicated by Q. Ca-tulus in 69; and was again burnt in A. D. 69 by the soldiers of Vitellius, and rebuilt by Vespasian. In the reign of Titus it was burnt a third time, A. D. 80, but Domitian restored it with great magnificence. It contained three shrines, consecrated respectively to Jupiter, Juno, and Minerva. The form of the Capitol was nearly a square, being 200 ft. long and 185 ft. broad. In the piazza or portico the people were feasted on triumphal occasions. The victorious generals went up there in procession to offer thanks and sacrifice. The Sibylline books and the most important public documents were deposited there. Other temples were one by one raised on the Capitoline hill. Among these, the temples of Juno Mone-ta, with the mint attached, of Jupiter Feretrius, of Mars, of Venus, of Fortune, and of Isis and Serapis were the most considerable. A bibliotheca or library, the tabularium, athenaeum, and other public buildings were also on the hill. At the S. end was the Tarpeian rock, down which state criminals were thrown headlong. - The top of the Capitoline hill now forms the piazza del Campidoglio, surrounded on three sides by palaces, built or altered from designs by Michel Angelo. On the N. side is the palace of the senator, on the "W". 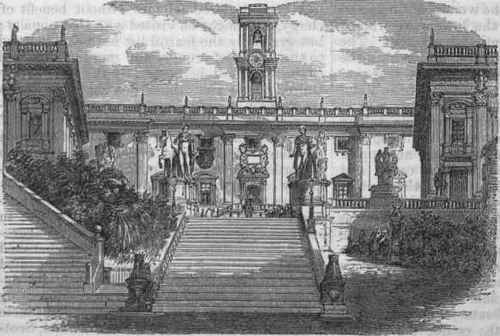 the palace of the conservators, and on the E. the museum of the Capitol. The ascent to the piazza is by a broad flight of steps, at the foot of which are two Egyptian lions, and in the angles of the balustrade's at the summit are colossal statues of Castor and Pollux standing by their horses. Near by is a collection of marble sculptures formerly supposed to be the trophies of Marius, but now assigned to the age of Domitian, and the ancient milestone which marked the first mile of the Appian way. In the centre of the piazza is a bronze equestrian statue of Marcus Aurelius, one of the finest ancient works of the kind; the horse is especially good. There are also the statue of Minerva, commonly called "Rome Triumphant," and colossal figures of the Nile and the Tiber. The palaces contain innumerable objects of great artistic or' historical interest. On the first floor of the palace of the senator are several statues; the second floor is mainly occupied as the offices of the municipality and the police courts; above is the astronomical observatory, and the tower, which affords the finest view of Rome and its environs. In the palace of the conservators are halls containing busts of eminent Italians, the gallery of pictures, and many ancient statues and fragments of sculpture; the famous "Bronze Wolf;" the Fasti Consu-lares\ or list of names of the Roman consuls and magistrates to the time of Augustus; and Michel Angelo's restoration of the Builian column, erected in 260 B. C, with what remains of the original inscription, probably the oldest extant Roman inscription. In the picture gallery are several paintings by eminent artists, the masterpiece beingGuercino's "Santa Petronilla." There are in all about 230 paintings, but only a few are of superior merit. In the palace of the museum is a fine sarcophagus with bass reliefs representing the story of Achilles; it was exhumed from a tumulus which contained the celebrated Portland vase, in which were the ashes of the person to whom the tomb was erected. There are also fragments of the Pianta Capitolina, or ground plan of ancient Rome, engraved upon marble; the famous statue of the '; Dying Gladiator; " the " Antinous of the Capitol,"' found in Hadrian's villa, one of the most perfect statues in existence; the " Faun'.' of Praxiteles, liner than that in the Vatican; the " Faun " in rosso anti-co, notable for the rarity of the material and its line sculpture; and a sarcophagus with bass reliefs of the battle of Theseus and the Amazons, containing one group which Flaxman pronounces among the best specimens of ancient reliefs. In the hall of illustrious men are 93 busts of famous Greeks and Romans, many of them of doubtful authenticity. In the hall of the emperors, besides numerous bass reliefs, is a series of 83 busts of emperors and empresses. The hall of the doves contains an exquisite mosaic, representing four doves drinking, formed of pieces of natural stone so small that 160 are contained in a single square inch. In the "reserved cabinet," not open on public days, is the famous "Venus of the Capitol," which was found walled up in a chamber so carefully that the only parts fractured were the point of the nose and one of the fingers. The Modern Capitol at Rome.